Posted on May 30, 2016 at 11:13 am. Aristocrat Leisure is a huge brand globally, with its dominance of the North American market a huge factor in its profitability. 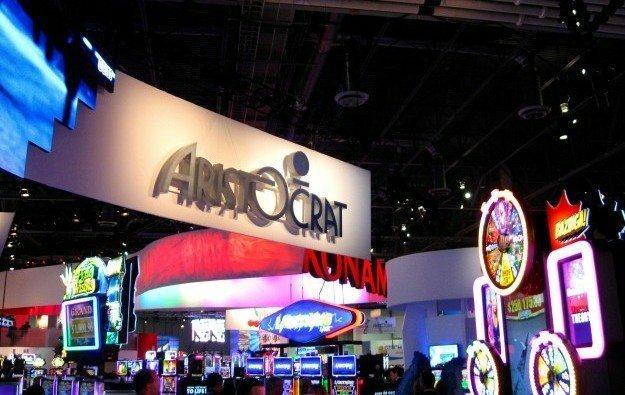 Australian poker machine company Aristocrat Leisure has continued to post record profits, the latest result coming on the back of the tribal casino market in North America. The company, which has its head office in Sydney, increased its net profit to 183.2 million, a 66 per cent jump. The strong revenues have helped the company’s shares surge by 60% in the last year. Aristocrat had predicted the impressive profit earlier in May, with its dividend jumping by 25 per cent for the six-monthly period to $10 cents per share, giving the company its 10th consecutive period of revenue growth. Aristocrat chief executive Jamie Odell said the company was intent on increasing the size and scope of the business, rather than focusing on profits. “Most of our shareholders tend to think of us in terms of total shareholder return and clearly they have seen significant share price accretion in the course of the last 12 months, which combined with the dividend growth, means it has been a very high performing TSR stock on the ASX,” he told local media. While Aristocrat has traditionally made money by either selling pokies venues the machines, or placing them in pubs or clubs, and receiving a revenue share, some of the recent good news has come on the back of the company’s blossoming digital sector. The company has indicated publicly it will continue to grow its digital offering, including similar acquisitions to 2012 purchase Product Madness, a US social platform where you can bet on virtual slot games like Heart of Vegas. This forward thinking has seen digital profits lift to $46 million, from $17 million, with Android mobile casino users mentioned as a factor in driving dividends. The Australian-New Zealand branch of the company also posted a $213 million profit, which is about a 20% slice of the total profit. Much of this growth has come on the back of the Helix Pokies range, with Lightning Link and Lightning Cash games very popular. Australian Walking Dead fans would undoubtedly love to play The Walking Dead II pokie game, but it won’t be happening any time soon. Gambling laws in Australia stop the company from offering its digital games to the country, while the spin off pokie from the popular TV show and comic series is yet to to be released in Australian pubs and clubs. The first game was met with great praise, with it winning the “Slot Product of the Year” and players naming it the “#1 best penny slot”. The second was also greeted fondly at the Pechanga Resort and Casino in California on May 19. “We are thrilled to host the world premiere of this exciting new game,” said Alex Rodriguez, Vice President of Slot Operations at Pechanga. The Walking Dead II game follows the adventures of Rick Grimes and other characters from the TV series, original game and comic books. It heavily lends its story line from the third season of the smash TV show, with it including features like random Michonne Attack bonus, Reel Growth for up to 300 lines, and Wild Horde multipliers. Other bonus features include Governor Jackpot Bonus and Governor Free Games. Looking for a safe online casino site that accepts players from United States? We recommend Raging Bull Casino which offers a large selection of casino games and trusted deposit methods.